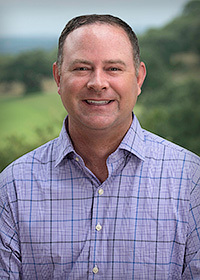 My name is John Kuhry and I came to Cordillera Ranch after 15 years in the golf industry. I worked as a PGA Head Golf Professional and sales professional for Callaway Golf and TaylorMade Golf. My wife, Amie and I have been married for 14 years and we have two young boys, Ben and Michael. Working in the Visitors Center here at Cordillera Ranch gives me knowledge of the community that few other agents have the opportunity to obtain. And working solely in Cordillera Ranch provides me a daily appreciation of the beautiful Texas Hill Country and our development. I would very much like the opportunity to help you with your home or lot purchase here in Cordillera Ranch and I will do my best to earn your business. Please contact me to schedule a tour, or if you are planning to sell your current home or lot. I am always happy to help. Thank you for considering me when it comes to your real estate needs here in Cordillera Ranch.